I know I keep harping on about it, but the scent of some winter flowering plants is really something quite special and at the moment, the Sweet Box (Sarcococca confusa) is absolutely heavenly…. Sarcococca is an evergreen shrub for shade or semi-shade and will also cope well with dry conditions and sites that are exposed to atmospheric pollution. 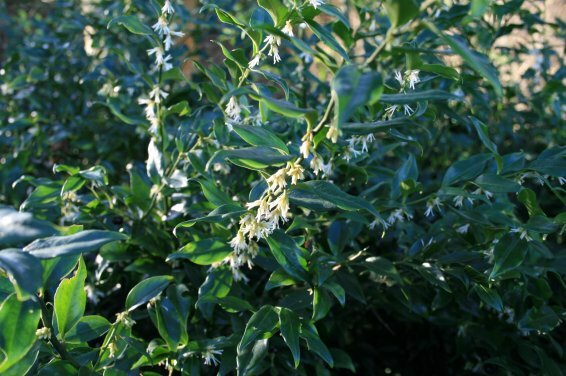 It has a neat shape and dark shiny leaves that can be clipped back in late winter or early spring if required and makes an excellent choice for a woodland garden or near a path where the scent of the flowers can really be appreciated. The small white flowers appear from December to March and are followed by small glossy spherical black berries. Other than the heavenly scent, it’s not a particularly memorable plant to look at, but it is a perfect choice for those tricky shaded areas in the garden where not much else will grow and it will give structure and texture in the garden all year round, even when the summer performers are doing their thing. It makes the perfect choice for a shady front garden, preferably close to a path or the front door, so that every time you walk out of your house you’re greeted with the most heavenly smell at a time of year when the sky is mostly grey!